Omega-3 fatty acids are known as an essential fat. Your body cannot produce this fat so you will need to take it in from dietary sources. Some plants contain omega-3 fatty acids, but most sources that are high in this particular ingredient are fish. Coldwater fish are particularly high in omega-3 fatty acids because they live in environments that promote production of this fat very well. Increasing your intake is commonly recommended to help you get the omega-3s you need. Choose Saltwater Fish- Salt water fish tend to have more omega-3s than freshwater varieties. They tend to live in deeper, colder water that makes it necessary for them to produce additional omega-3 fatty acids as insulation. Mackerel and sardines are particularly well-known for containing high amounts of this fatty acid. Salmon and trout are also known for containing high amounts of omega-3s. Pick Wild-Caught Fish- If you are buying wild caught fish, ask about how they were caught before purchasing. If a fish was caught using a line that is towed along the boat, this is known as toll-catching. This allows fishermen to examine the fish and determine if it is high quality, letting them toss back fish that do not make the grade. This is a more environmentally friendly way to fish and helps ensure that the fish you get will be high in omega-3s. Also make sure you know what types of omega-3s are in the fish you are purchasing. Usable omega-3 fatty acids can be easily absorbed by the body, so these are the type you want in your diet. Farm raised fish will have more fat than those that have been caught in the wild, but this fat will not contain as much of the usable omega-3s that you need. Shop at the Right Stores- Ask your fish vendor if they work with environmental groups that monitor fishing practices. These groups will only work with vendors that use safe and environmentally sound practices to deliver the highest quality fish possible to their customers. This will help make sure that the fish you get are healthy and contain a good level of omega-3 fatty acids. 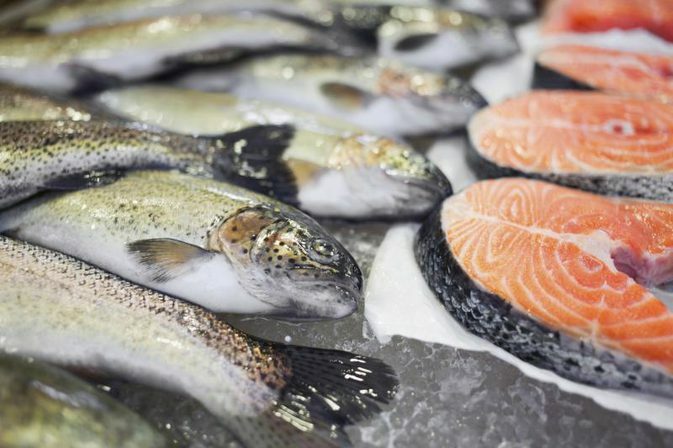 Avoid Fish with High Mercury Levels- The dangers of consuming too much mercury are much worse than the potential benefits of consuming more omega-3s. Avoid eating too much swordfish, shark and tilefish from the Gulf of Mexico that can be high in mercury. Eat Fresh Fish Instead of Fish Oil Supplements- Fish oil supplements will be very high in omega-3 fatty acids, in some cases more than you would get from eating fish, but your body has an easier time absorbing fats from a natural state. If you decide you need to use a supplement, make sure you select a brand that uses the same rigorous guidelines applied to the fish to ensure you get a high quality product. What Kinds of Cold Water Fish to Eat and Avoid? Salmon- Salmon is one of the top sources of omega-3 fatty acids, particularly king or Chinook salmon that is caught between Alaska and California. Leaner versions of salmon like sockeyes are still high in this fat, though they are not quite as beneficial. Farmed based salmon will also contain lower levels of omega-3s than wild varieties. Sardines- Sardines are an inexpensive way to get more omega-3 fatty acids. Unlike some other varieties, you can still bet plenty of omega-3s from this fish if you cook them. Smelt- Frozen smelt are readily available. They are commonly prepared by frying in a light batter to make a fun presentation. Shad- Shad are more available on the coast than in other parts of the United States. They are milder than fish like herring or sardines, but you may have to deal with removing the bones based on the area where your filets are from. Anchovies- You will typically find anchovies preserved because they spoil very quickly. These preserved or cooked anchovies will still contain high amounts of omega-3s, making it easy for you to add this benefit to dishes that could use a bit of extra salt or briny flavor. Fish that have a high mercury count should be eaten sparingly or avoided altogether to prevent potential dangers. Those that are breastfeeding, feeding young children, are elderly or pregnant should make a point of avoiding these fish. Tuna and mackerel are particularly known for having high mercury counts, though light canned tuna may have a lower mercury count. Albacore tuna, shellfish, king mackerel, shark, swordfish, tilefish, any fish that has been exposed to dye to preserve its color and farmed fish that were not cared for by aqua culturists can be unhealthy as well. Head to your local market or fishmonger and order a fresh cold-water variety like cod, sardines, salmon or herring. Salmon and herring have some of the highest omega-3 counts. Make sure you know how to cook these fish as very fatty fish will be darker than a standard white fish. Make a point of eating your fish soon after purchase as oily fish spoil very quickly. Grilling cold-water fish can help you manage their strong flavor. Some find that baking or broiling cold-water fish intensifies the "fishy" taste many find unpleasant. Only eat around 5 ounces of this fish per week to avoid consuming too many toxins like mercury. Those that are pregnant or breastfeeding may need to eliminate their intake of these fish to prevent potential dangers. How Does Lemon Tea Benefit You?